For many of us, childhood camping trips are some of our fondest memories. Remember the s’mores and campfires, the old tent that leaked, and lazy afternoons reading in a hammock? Kids tend to gravitate toward camping in a way that adults can’t recreate. They understand the power of dirt, and rocks, and sticks–things that can entertain for hours. If camping is memorable for children, bike camping takes the memory-making to a whole new level. Rather than zoning out in the backseat of a mini-van, kids get to experience the world as it passes by. The journey to the campground is as much fun as the campground itself. A boring country road becomes anything but when you stop for ice cream at a dilapidated old general store or search for treasures in a roadside ditch. There are lots of ways to bike camp with kids and none of it requires special gear. In fact, you can employ whatever setup you currently use to bike around town with the kids. 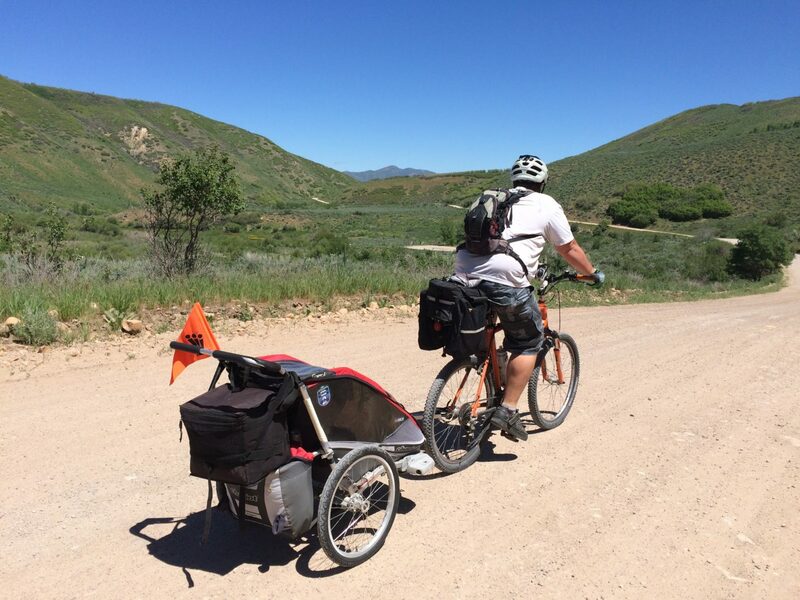 On our first outing, my husband pulled a kids bike trailer with a tent and sleeping bags and I hauled our 3-year-old in a Weehoo. Other families use cargo bikes to haul both the kids and their gear. If your kids are older and can ride their own bikes, you could even use racks and panniers on their bikes (and yours). Similarly, your route and destination can be as adventurous or as simple as you would like. Ride your bikes across town and pitch a tent in grandma and grandpa’s backyard. Choose a dirt road that ends at a lake. Use some vacation time and bike the White Rim Trail in Utah or the Mickelson Trail in South Dakota. If you’re a social type, it’s even possible to find other families to bike camp with. In Chicago, Out Our Front Door, offers guided family bike camping outings to places like the Indiana Dunes National Lakeshore. In Madison, WI, the Cargo Bike Shop, hosts a family bike overnighter to Lake Farm County Park. You can also try joining a local cycling Facebook group in your area, or ask local shops, to find out what other low-key family bike trips might be available. A tent. Bivouacs are okay when you’re 25 and single; they’re not so great when you have kids and its raining outside. Meals that don’t require much prep or cooking. Bring something pre-prepared like fried chicken and fruit salad. If you’re headed somewhere with places to eat, you could also just plan on buying meals. Plenty of water, or a plan on where to refill water. Entertainment items that are small and lightweight. A deck of cards and a collapsible frisbee work great. Basic bike repair items–a multi-tool, spare tubes, etc.